SEO for artists is a complex issue -how does one optimize an art site from an SEO point of view? 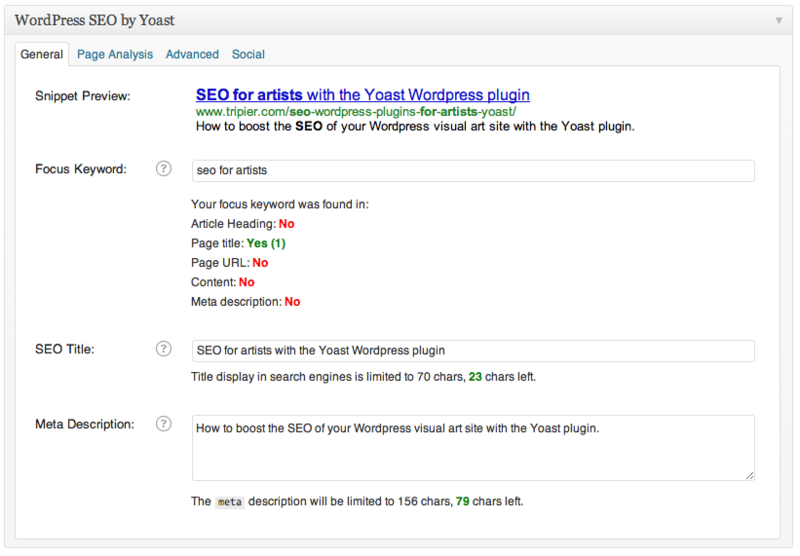 I use the Yoast SEO plugin on my WordPress sites and I absolutely love how easy Yoast makes it to get your basic SEO in place for us visual artists. Here is my top five key things to think about or optimize as you get started using Yoast. While none of this will get to make better art, it might get you to make more of it and connect with your audience and fan base sooner. 2. Do you need a plugin? Yes. Artists write posts to show off their latest creation and SEO rarely comes to mind when we do so. The end result is an incomprehensible display and ranking of your post by Google as the search engine struggles with your image and the lack of indexable content associated with it. 3. Alternatives to Yoast. There are many alternatives to Yoast on WordPress, with several very good options such as All in One SEO. I have tried many and ended up settling on Yoast mostly because I find the interface and how it inserts itself into the workflow of creating and publishing a new post easier for me. I have no affiliation with Yoast whatsoever so this is my unbiased opinion -but you will have to test a few alternatives to see if it workd best for you too. In the end, the best SEO plugin is the one you actually use. 4. Setting up Yoast is trivial as long as you know how to navigate Google analytics and webmaster tools. After installing the plugin you can take a tour of the different functions and setup steps right into the plugin’s dashboard. If that is not enough, there is a very complete Guide to Yoast regularly updated by its author. Ultimately, the plugin appears to be designed for the standard, 300 word SEO optimized blog post and not for the “98% images and 2% content” post format artists use. If you know of an SEO tool that better integrates the image attributes with content SEO, let me know! Thanks for this post. I bookmarked it a while back, and have read other information on using Yoast SEO in the meantime. I’m setting up Yoast SEO today and finally got back here to read your thoughts. I’m glad I did because THIS POST gets right to the point (Item 5) and is more clear, practical and helpful than all the “complex” sources I’ve read. Thanks for pointing out the limitations regarding the focus on 300-word posts, as appears below your screencapture image. I have the same problem you do: posts = image and not so many words. This Yoast SEO blog post of yours has been around a while, so maybe Yoast SEO has improved in this regard over time. I’ll know in an hour or two…(grin).